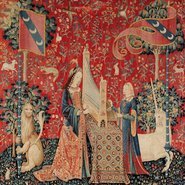 Each concert in this series includes music from the time of The lady and the unicorn tapestries – late medieval and early Renaissance music by Guillaume de Machaut and Guillaume Dufay – along with specially commissioned premieres by Australian composers Moya Henderson, Alice Chance, Bree van Reyk, Victoria Pham, Amanda Cole and Brooke Green. How is the lady idealised in music from the time of the tapestries? This program includes a secular lady singing a chanson royale by Guillaume de Machaut, the lady as Virgin Mary by Guillaume Dufay and a rondea with an intriguingly close connection to the sixth tapestry: Mon seul et souverain desir by Gilles Binchois. How is the Lady idealised in music from the time of the tapestries? This program includes music by Guillaume de Machaut, Guillaume Dufay, Josquin Desprez and one of the most famous early Renaissance pavanes Belle qui tiens ma vie by the Catholic priest and dance theorist Thoinot Arbeau. This concert will now be held at 7.45pm, rather than 7.30pm, at the InterContinental Sydney, 117 Macquarie Street, Sydney.